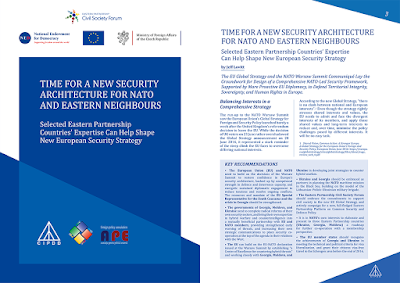 The overview policy paper from the project, Security Alert on the EU's Doorstep: How Can the NATO Summit Contribute to Strengthening Security in the Eastern Partnership Countries? will be presented at a roundtable event hosted by the Polish Institute of International Affairs (PISM) in Warsaw on 21 June 2016. The authors of the paper are Ghia Nodia, Chair of the Caucasus Institute for Peace, Democracy and Development, Jan Piekło, Executive Director of the Polish-Ukrainian Cooperation Foundation (PAUCI), and Jeff Lovitt, Chair of New Diplomacy. Jan Piekło, a co-Founder of New Diplomacy, is set to become the new Ambassador of Poland to Ukraine. His appointment is pending only the confirmation of the Senate. 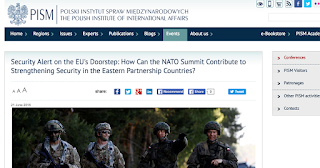 The debate is organised to mark the publication ahead of the NATO Warsaw Summit of a new policy publication addressing the internal and external security challenges facing the six Eastern Partnership countries (including policy recommendations for international actors and for the Eastern Partnership countries' governments and other stakeholders). The event is organised in the framework of the Caucasus Institute for Peace, Democracy and Development (CIPDD) project supported by the Eastern Partnership Civil Society Forum Secretariat.